Recorded as from New York City. (Unidentified antique dealer, Lockport, New York.) Sold in 1947 to (Haydn Parks, Buffalo, New York). Sold to (The Old Print Shop, New York), by whom sold in 1948 to Edgar William and Bernice Chrysler Garbisch; gift to NGA, 1971. Extended loan for use by Secretary William T. Coleman, Jr., U.S. Department of Transportation, Washington, D.C., 1976-1977. The American Folk Art Tradition: Paintings from the Garbisch Collection, National Gallery of Art, Washington, D.C., 1978. American Naive Paintings from the National Gallery of Art, Terra Museum of American Art, Evanston, Illinois, 1981-1982, no. 28, color repro. (cat. by Ronald McKnight Melvin). American Naive Paintings from the National Gallery of Art (NGA National Lending Service exhibition), Art Museum of South Texas, Corpus Christi, 1993-1994. American Naive Paintings from the National Gallery of Art (NGA National Lending Service exhibition), Telfair Academy of Arts and Sciences, Savannah, Georgia, 1993. Extended loan for use by Secretary Richard Riley in his office at the Department of Education, 2000. American Naive Paintings from the National Gallery of Art (NGA National Lending Service exhibition), Heckscher Museum, Huntington, New York, 1994. American Naive Paintings from the National Gallery of Art (NGA National Lending Service exhibition), Louisiana Arts and Science Center, Baton Rouge, 1994-1995. American Naive Paintings from the National Gallery of Art (NGA National Lending Service exhibition), Boise Art Museum, Idaho, 1995. American Naive Paintings from the National Gallery of Art (NGA National Lending Service exhibition), McKissick Museum, Columbia, South Carolina, 1995. American Naive Paintings from the National Gallery of Art (NGA National Lending Service exhibition), Pensacola Museum of Art, Florida, 1995. American Naive Paintings from the National Gallery of Art (NGA National Lending Service exhibition), St. John's Museum of Art, Wilmington, North Carolina, 1995-1996. American Naive Paintings from the National Gallery of Art (NGA National Lending Service exhibition), Harn Museum of Art, University of Florida, Gainseville, 1996-1997. American Naive Paintings from the National Gallery of Art (NGA National Lending Service exhibition), James A. Michener Art Museum, Doylestown, Pennsylvania, 1996. American Naive Paintings from the National Gallery of Art (NGA National Lending Service exhibition), Laguna Art Museum, Laguna Beach, California, 1996. American Naive Paintings from the National Gallery of Art (NGA National Lending Service exhibition), Maier Museum of Art, Randolph-Macon Woman's College, Lynchburg, Virginia, 1996. American Naive Paintings from the National Gallery of Art (NGA National Lending Service exhibition), Williams College Museum of Art, Williamstown, 1997. American Naive Paintings from the National Gallery of Art (NGA National Lending Service exhibition), Florence Griswold Museum, Old Lyme, Connecticut, 1998. Extended loan for use by Secretary Richard Riley, U.S. Department of Education, Washington, D.C., 2000-2001. Viele, Chase. 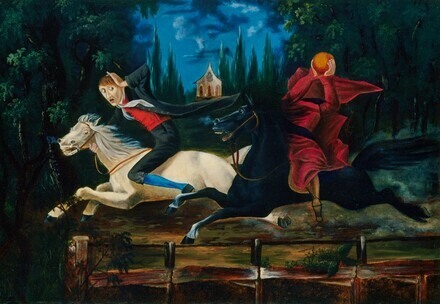 "Two Headless Horsemen of Sleepy Hollow." Antiques 114 (November 1978): 1042-1043. American Paintings: An Illustrated Catalogue. National Gallery of Art, Washington, 1980: 260, repro. American Paintings: An Illustrated Catalogue. National Gallery of Art, Washington, 1992: 383, repro. Chotner, Deborah, with contributions by Julie Aronson, Sarah D. Cash, and Laurie Weitzenkorn. American Naive Paintings. The Collections of the National Gallery of Art Systematic Catalogue. Washington, D.C., 1992: 395-397, color repro. 396.